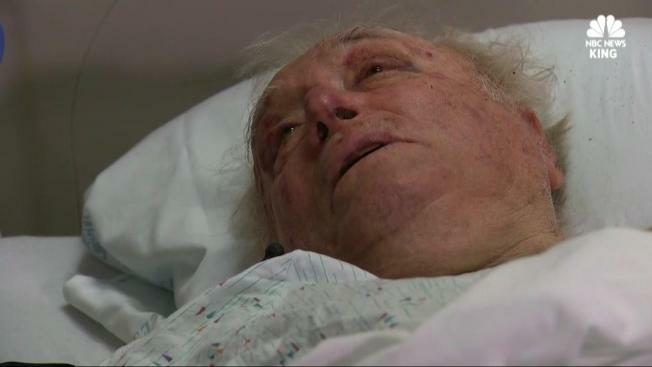 Train Survivor: "I Thought It Was A Bomb"
An 81-year-old who broke his back in the Amtrak train crash Monday managed to muster the strength to crawl out of the wreckage, and has survived to tell his story. Rudy Wetzel, a longtime rail enthusiast, jumped on board the brand new Amtrak train from Seattle to Portland Monday 6 a.m.. Wetzel only planned to take it to Centralia, but he didn’t make it that far. The train derailed with him on board. “I felt that any minute this whole thing was going to collapse on me,” he said. Wetzel broke his back in multiple places, but the octogenarian still managed to crawl out of the wreckage. “And the next thing you know is they put me on a board, and put me on a four-wheeler, and drove me out to an ambulance,” Wetzel said. Before the crash, Wetzel spoke with KING 5 on board the train. Reporter Alex Rozier and photojournalist Jim Scott departed the Amtrak minutes before the crash. Twelve hours after his first interview, the reporters spoke with him again, but this time from a hospital bed in Olympia, where he praised the people who came to his rescue. Wetzel said he thought the train was traveling about 40 miles per hour at the time of the crash. National Transportation Safety Board officials reported Monday night that the train was traveling 80 mph before the derailment. He said he plans to ride Amtrak again, once he heals up.